This entry was posted in Separates and tagged button holes, clothing, dressmaking, fashion, handmade, overlocker, sewing, Simplicity 3971. Bookmark the permalink. Nice PJs – I like the bias cut pocket and cuffs. 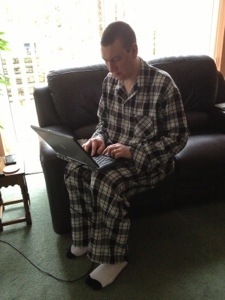 My only adventure with a unisex pattern was also PJs. I think I cut the small, for myself, and ended up giving them to DH who is at least 8″ taller than me, and weighs about 70 pounds more! What is i with patterns these days? I’ve had a couple of similar experiences lately with garments ending up way bigger than you would expect from the measurements on the envelope. Oh, and good on your for matching stripes. I wouldn’t bother on pyjamas. I have a suspicion that there’s something seriously wrong with the computer based drafting systems at some pattern companies. Wish we had a way to give them feedback. Aren’t jammies meant to be baggy tho?